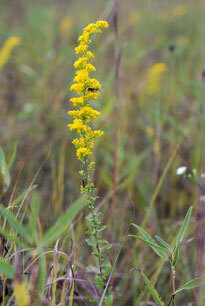 Also Called: Old-field goldenrod, prairie goldenrod. Stems: Erect, 1-10, often clustered, finely-hairy with grayish or whitish pubescence. Leaves: Alternate, upper leaves different shape than lower; basal leaves well-developed, spatulate-ovate to oblanceolate, 2-8 inches long, 1/3 to 1.6 inches wide, surfaces finely-hairy with grayish or whitish pubescence, conspicuous mid-rib, lateral nerves less prominent, arranged feather-like; margins shallow-toothed to entire; tip pointed; base tapering to winged stalk; mid and upper stem leaves linear-oblanceolate; margins entire; sessile; progressively reduced upward. Inflorescences: Panicle, long and narrow to pyramidal, 3 to 10 inches long, 1-4 inches wide, tip sometimes drooping; branches often long, spreading, curved downward; heads directed to 1-side. Flowers: Involucre narrowly bell-shaped, 1/6 to 1/4 inch tall; bracts ovate to linear-lanceolate, unequal, overlapping , margins fringed; ray florets 4-9, short, yellow; disk florets 3-10, yellow. Fruits: Achene, cone-shaped, ribbed, short-hairy, tipped with numerous white, hair-like bristles, enclosing small seed. Habitat: Prairies, old or fallow fields, dry open woods, eroded slopes, thickets, roadsides; sandy soils. Uses: Native Americans boiled the roots and used the liquid to treat jaundice and kidney disorders. The leaves were boiled and the liquid used as a wash for burns and skin ulcers. The Navajo burned the plant as incense. The seeds were used for food. Comments: Gray goldenrod is shorter and less aggressive than Canada goldenrod. It is sometimes used in flower arrangements.